Not to be confused with Libra (constellation). Libra (♎) is the seventh astrological sign in the Zodiac. It spans 180°–210° celestial longitude. Under the tropical zodiac, the Sun transits this area on average between (northern autumnal equinox) September 23 and October 23, and under the sidereal zodiac, the sun currently transits the constellation of Libra from approximately October 31 to November 22. The symbol of the scales is based on the Scales of Justice held by Themis, the Greek personification of divine law and custom. She became the inspiration for modern depictions of Lady Justice. The ruling planet of Libra is Venus. Libra and Aquarius are the only zodiac constellations in the sky represented by inanimate objects. The other eleven signs are represented either as an animal or mythological characters throughout history. Libra is one of the three zodiac air signs, the others being Gemini and Aquarius. 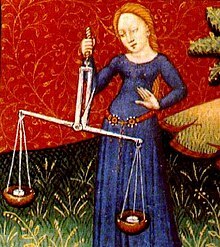 The sign of Libra is symbolized by the scales. The moon was said to be in Libra when Rome was founded. Everything was balanced under this righteous sign. The Roman writer Manilius once said that Libra was the sign "in which the seasons are balanced". Both the hours of the day and the hours of the night match each other. Thus why the Romans put so much trust in the "balanced sign". Going back to ancient Greek times, Libra the constellation between Virgo and Scorpio used to be ruled over by the constellation of Scorpio. They called the area the Latin word "chelae", which translated to "the claws" which can help identify the individual stars that make up the full constellation of Libra, since it was so closely identified with the Scorpion constellation in the sky. According to the tropical system of astrology, the Sun enters the sign of Libra when it reaches the southern vernal equinox, which occurs around September 22. ^ a b c Ridpath n.d.
Atsma, Aaron J. (c. 2015). "Themis: Greek Titan goddess of divine-law, custom & prophecy". Theoi.com. Retrieved February 6, 2015. "Horoscopes, Tarot, Psychic Readings". www.astrology.com. Archived from the original on September 23, 2015. Retrieved August 4, 2015. "Libra". Oxford Dictionaries. n.d. Retrieved March 1, 2018. 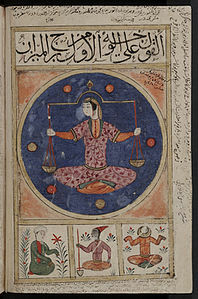 "Libra Nature - Libra Ruling Planet". www.ganeshaspeaks.com. 2015. Retrieved August 4, 2015. Ridpath, Ian (n.d.). "Star Tales – Libra". www.ianridpath.com. Retrieved March 8, 2016. "Scorpio". Oxford Dictionaries. n.d. Retrieved December 23, 2018. Shapiro, Lee (1977). "The real constellations of the zodiac". Internatioal Planetarium Society. Retrieved January 12, 2019.